Sustainability is a popular and important issue facing designers, builders and building owners. Unfortunately, it is also complex. Recent developments have shown that programs such as LEEDS assessments do not always reveal the correct or best decisions about material selection or building strategies. 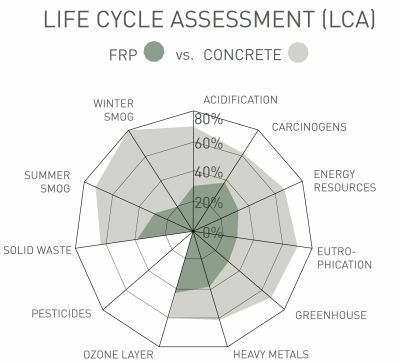 The more appropriate but also more rigorous method is "Life Cycle Assessment" or LCA's where a material's total, cradle to grave environmental impact is compared to an alternative. These exercises are complicated and project specific. For example, often the weight of a product plays a significant roll in impacts like transportation, installation, and back-up structure. All these factors vary from project to project and to measure all these factors is usually beyond the scope of most conventional construction projects. Since 2009, Kreysler & Associates, has worked with Professor Michael Lepech PhD, and his graduate students at Stanford University's School of Environmental Engineering to compare FRP systems to other materials in given situations. We have done studies comparing an aquarium tank made of FRP to one made of shot-crete. We looked at GFRC vs. FRP for a large rain screen project in Eastern Europe, and limestone vs. FRP/polymer concrete building ornament replicas for a rehabilitation project in San Francisco. We measured the impact of FRP reflective acoustic panels on a new concert hall at Stanford vs. an alternative concrete system at the EMPAC Performing Arts and Media Center in Troy NY. We are currently comparing a large FRP sun shade to a float glass alternative and another GFRC rainscreen to a new highly fire resistant FRP system for the SFMOMA facade. Both ourselves and the students have often been surprised at the results. For example, things like stainless steel anchors, the type of particle board use for mold making, and the effect of sandblasting a surface instead of sanding it have all played significant rolls in these studies. Intuition suggest that FRP would not be a very "green" solution since it comes from petroleum. Surprisingly however this assumption is nearly always wrong. Although we have not always been the "greener" alternative, so far it has never been because of the FRP material. In the two cases where the study suggested the alternate to FRP was better, it had more to do with the choices we made about mold making material, anchors and structural support. One important factor to keep in mind however is that these are student studies, not professional peer reviewed papers. They are however carefully developed reports using state of the art technology, ISO standards, and up to date data. If you have specific questions, please let us know and we'll do our best to answer.